Workspace of sound design The Conjuring 2 (2016). CREATE A FINAL PROJECT THAT EMPLOYS VARIOUS TECHNIQUES USED IN HORROR FILMS TO ELICIT A PHYSIOLOGICAL RESPONSE IN AUDIENCE MEMBERS THAT EVOKES FEAR AND HORROR. UNDERSTAND THROUGH RESEARCH WHY SOUND DESIGN HAS A SPECIAL RELATIONSHIP TO FEAR AND FILM. In supplement to other projects, for this course we also learned about ADR (Automatic Dialogue Replacement) and how it is needed for many films that need another take that can’t be re-shot. For both of our clips, we completed the ADR using the Zoom H4N and our own voices, did multiple takes, and normalized the noise levels within them for the final clip sync. I also used Audacity for many other effects, such as reverb, and also editing music for distortion to sound like a record player. Workspace in Audacity for distortion of music to input into final edit of film clip. Note: There is a jumpscare towards the end of this video. As an intermediate class for sound design, it was very important for us to research first why sound design for horror films have such a special relationship. It was very interesting to understand physiological response from certain frequency ranges and why silence is so deafening in these films. This also gave us a very large amount of practice for both editing and sound as we had to do ADR (Automatic Dialogue Replacement) and edit certain pitches to elicit more fear in the audience. Workspace of sound design for sections of Paperman (2012). This school project took place in a very small studio class of 5-6 people. Each student, at the end of the semester, was tasked with creating their own interdisciplinary project that crossed theories we had been learning, such as soundscapes, auditory perception, soundmapping, sound design, and data sonification. I had always been interested in creating foley for film, but I also wanted to combine soundscape recordings and soundmapping into my goals. 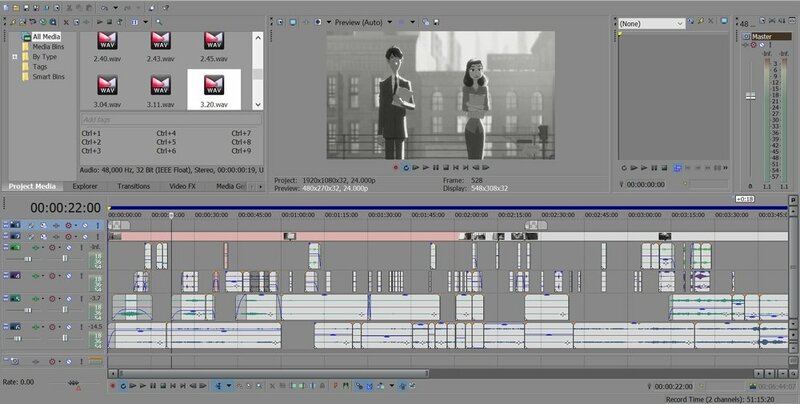 Therefore, I chose to redesign the sound for Paperman (2012), without music, but with just the soundscapes of Vancouver and with a little help from external audio sources such as freesound.org. Using a Zoom H4N recorder, I ventured around Vancouver and captured soundscapes of the city. Most notably, I recorded soundscapes of the skytrain and dubbed it in to the clips to replace the train noise of Paperman. I also recorded sounds of the city at rest and edited their reverbs to consider the building locations, echos, and their relationship to the open-air. Foley was recorded live, connecting the Zoom H4N recorder to my laptop and using Audacity to record. Many required noise normalization due to the room I was recording in; this was an extremely long process but I was pleased with the outcome. Above: Foley and ambiance recordings, using a Zoom H4N. Due to the large number of background sounds and foley that I had to put into the final version of the redesign, this project taught me the importance of keeping your digital workspace clean and clear for yourself and others to understand. Going out into the field to do actual recordings made me think about our relationship to our sonic spaces and made me much more interested in sound design - not just for film, but sound design for spaces and architecture. Many don’t think of the implications sound in a certain space, but it really changes the atmosphere and mood of existing in that place.